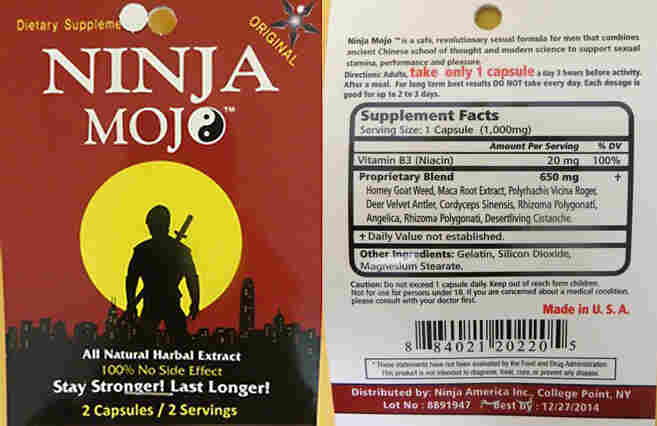 FDA: 'Ninja Mojo' And 'Love Rider' Contain Hidden Drugs : Shots - Health News The Food and Drug Administration says it can't keep up with all the dietary supplements that claim to enhance sexual performance. Many have been found to contain potentially harmful ingredients, so the agency is warning people to beware of the entire bunch. The Food and Drug Administration says its tests have found undeclared drug ingredients in supplements marketed for the enhancement of sexual performance. Even before the Food and Drug Administration's latest safety warning to men about dietary supplements that claim to enhance sexual performance, there were clues of trouble. The label for Ninja Mojo, for instance, misspells herbal as "harbal" and says buyers of it should "keep out of reach form [sic] children." The package touts the product as a "safe, revolutionary sexual formula for men that combines ancient Chinese school of thought and modern science to support sexual stamina, performance and pleasure." The FDA said that's not the whole story. The agency said its lab found that Ninja Mojo omitted from its long list of herbs an ingredient that modern science definitely made possible: tadalafil, the active ingredient in the prescription drug Cialis. On Tuesday, the agency said Love Rider, another supplement, also contains tadalifil, though its label doesn't say so. A third supplement, AFFIRM XL, contains undeclared sulfoaildenafil, a chemical cousin of sildenafil, the active ingredient in Viagra, FDA said. FDA keeps a long, running tally of "tainted sexual enhancement products." And the names of these supplements suggest the marketers have fertile, if not overheated imaginations. There's Rock-It Man and Kaboom Action Strips and the geological-sounding Firminite. What the supplements have in common, according to FDA, are hidden chemicals that are either identical to or very similar to the active ingredients in approved pills for impotence. While these ingredients may work, they come with side effects and risks. Men who use supplements containing these chemicals at the same time they're taking drugs called nitrates, such as nitroglycerin for angina, could experience dangerous drops in blood pressure. "These deceptive products can harm you!" FDA said. And there are a lot of them. So many, in fact, that the agency says it can't keep up with all the sexual-performance supplements that might contain potentially harmful ingredients. So the feds are warning people to beware of the entire bunch.